In this article we will see how to automatically calculate and draw the mean (average), the median, the standard deviation and the mode of a barchart. For doing this we will use the jqPlot library. Fig.1: a barchart showing the mean, the mode and the median. First, let’s start with defining the sequence of input data. Generally this data comes from an external data source and it is not specified within the web page. Often this data is the result of a SQL query on a database, or reading a file (such as .txt, .csv, etc), or an acquisition from a device, or they are the data from a monitoring station or more generally from a sensor. For the sake of clarity, in this example we will directly refer to a sequence of already defined data within an array which we call data. In real situations, it is up to us to implement the function, or use functions from other libraries, which will allow us to read data from external sources, making it a parsing to select only the data we are interested in, and if it is necessary, converting it to an appropriate format (often from string to numeric). 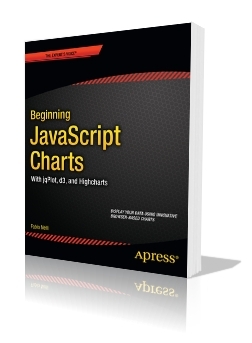 Furthermore there are various chapters about barcharts along with several examples which explain how to develop a barchart with many different configurations – with horizontal or vertical bars, with stacked or grouped bar, and so on. In addition we will show the standard deviation as a shaded area centered on the mean. Finally we will see how to to add a line representing the mean calculated point by point. Once we have written the library, we need to include it in our web page. Thus, we will add this row to the code. Now, three new dashed lines are shown in the bar chart (see Fig.3): the median is the blue line, the mean is the balck line and the mode is the red line. 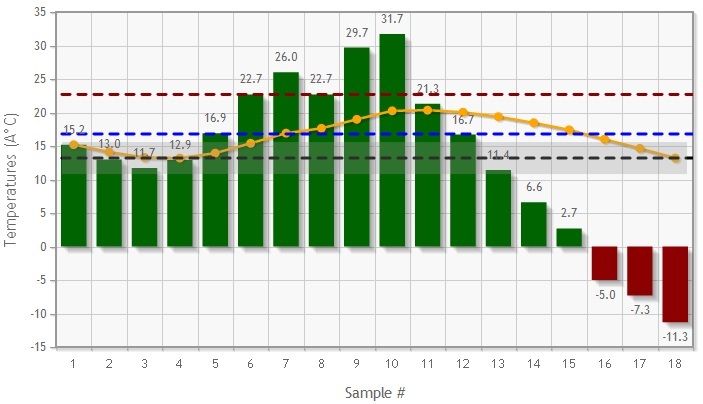 The yellow line which floats over the graph is the mean calculated in each bar, in which only the previous points (on its left) are evaluated in the caluclation. At the end, this line will tend to the black dashed line, that is the mean calculated considering all values. Fig.3. The mean, the mode and the median are now represented by three dashed lines. By the end, we can also show the standard deviation as a shaded area centered on the mean line. Let’s add tje following rows of code within the canvasOverlay property. Fig.4: a bar chart showing the standard deviation as a shaded area centered on the mean line.